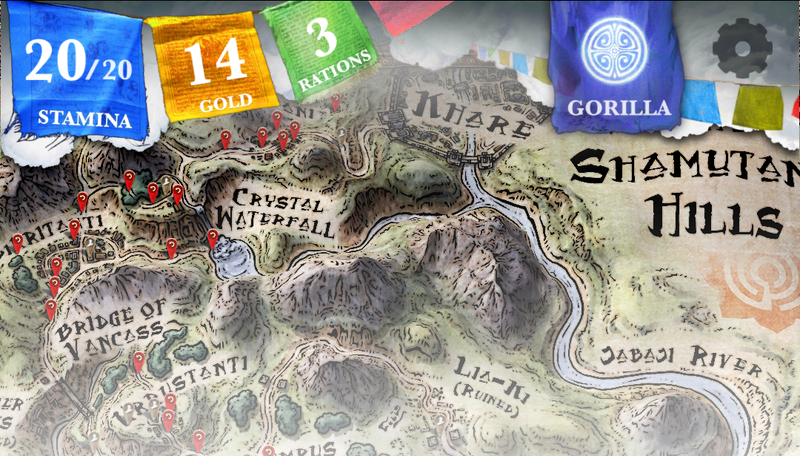 This is a growing guide for Steve Jackson’s Sorcery! 1: The Shamutanti Hills. (And here are guides to Sorcery! 2 and Sorcery! 3.) Your adventure begins! And I am so excited for you. Since you can visit places in various order, my tips are in random order. Please do feel free to share any awesome gameplay events that you’ve experienced! I’d be very grateful if you corrected me about any character names I got wrong, and informed me of the names I’ve forgotten/neglected to include. You can start your adventure anew in each game (you’ll automatically be given appropriate equipment in Sorcery! 2 and 3 since these are sequels.) The “cloud save code” that Sorcery! 2 and 3 allow you to input when you start up the apps enables you to continue your adventure from the previous game(s). This allows you to retain your relationships, equipment, items, learned spells, and knowledge, making for an incredible, elongated game experience. Your game save can be sent to the cloud once you have finished your playthrough. You can have many saves per Sorcery! game, and can choose which save you want to continue from in subsequent games. Some persons have voiced that the very first “Sorcery!” game is shorter than they expected (for the price of the app – $5. I received Sorcery! 1 and 2 from my wonderful little sister #1, Aurelia Wang, via Humble Bundle.) The second and third games are, in my experience, notably longer, and can keep you amused for several hours. The replay value of all the games is compellingly high; there are still so many unseen events despite thorough playing. All events are rewarding and interesting to experience, and build off of each other. Your quest for the Crown of Kings does not come to a complete end once this game is over, because this app is based on a four-book series dedicated to reclaiming the Crown. This is just the first book of a long, great adventure and many exciting subplots and characters. Here are some fun challenges to look forward to if you are just starting out! Advice | How many gold coins should I accept at the beginning of the game? Some good advice I heard when I started playing Sorcery! was to spend gold on things that you find useful. It seems it is everyone’s experience that gold is not too difficult to come by, especially in subsequent games. Snag that bag of creature teeth. The giant and goblin teeth can be used in helpful spells (YOB and GOB, respectively) and the snattacat and ape teeth sell for great prices in Tinpang’s “dental” store in Sorcery! 3. It seems that if Glandragor’s axe is somehow your only weapon when you meet him, the generous man will give you a replacement sword whereupon receiving his axe. This proved useful in many situations; casting JIG with the flute causes enemies to dance away (no shedding blood needlessly; you can even take possessions from them while they are busy jigging,) and helps get the party started at the Thieves Fair in Sorcery! 2. I believe you shouldn’t buy the “sweating” jewel. From what I’ve heard – it is a Frost Jewel that will melt away. Magical Item | Obtain some beeswax and a ration of honey from one of the first trees you come to. After climbing up to help the old man down from the tree and/or looking up into the tree (doing these actions results in noticing a beehive,) you can cast DOZ on the bees to slow them down and peacefully retrieve the beeswax – and some honeycomb (which counts as a ration!) – with the least loss in stamina. If Jann the Minimite [who qualifies as a pest to magic-users] is still with you when you meet Gaza Moon, he may be in trouble when she gets her spell-page back! Event | Aliana is in some trouble in the Meddiki Forest. She’ll be good to you! If anyone needs noseplugs, this is the lady to receive them from! Item | Boots wit’ da fur – in the Schanker Mines. Find warm Borrinskin boots at the end of the dark tunnel when you leave the Schanker Mines. They’ll protect your feet from any amount of ice and snow. Event | **Heal a family at the plague village, Urrustanti. Enter one of the huts and cast the dOC on your Blimberry juice potion, and then throw the liquid at the family inside. This heals the occupants of the plague. Event | ***Have Jann the Minimite voluntarily go help the plague village. You can make Jann willingly (!) leave you for a charitable reason. When you are near Dhumpus, observe the village nearby (Urrustanti, the one on a hill.) Observe the village enough (and/or enter it and/or look back at it when you leave it behind) to the point where you notice that it is a plague village. Jann automatically joins you a while later. Start to head back to tell the village of this magical water that flows so closely to them. Jann eventually stops you to volunteer himself for this job instead, assuring you that Minimites are immune to plague and that he may have a good place to live if he has a grateful village in his debt. Magical Items | Toothy giants be livin’ in caves. Event and Character Meeting | You can meet Flanker the assassin right before making it to Torrepani Village. Flanker the assassin is hiding in the little forest. Your dangerous quest is indeed a solo one and Flanker also has his own work to take care of, but he will be a helpful recurrent character whose scenes are something to look forward to. Ration | Be good to elders for a Bomba fruit. The changes your spirit animal undergoes reflect your character (your morals, choices, and adventuring style.) I always ended up with a gorilla at the end of my playthroughs for Sorcery! 1. Your spirit is the Gorilla. The king of the Great Apes, a creature of honour and good faith, who accepts both danger and misfortune as travelling-companions without hesitation. Since he tried to steal a spellpage from the witch, Gaza Moon (who lives near Crystal Falls,) he was “transformed” by her aging curse. You can pick up various keys from folk in the game. Some of them come into play in subsequent games! When you go into the manticore’s cave to rescue the Svinn girl, you can purposely set off – and survive – all of the traps in the maze of tunnels. In my playthroughs, I followed a poem’s advice instead and avoided the traps (if you have not heard the poem in your playthrough, observe the cave’s/tunnel’s decor for hints.) If I were to play through this part again, I think I’d like to try thwarting the traps! The hit series of role-playing books by Fighting Fantasy that these apps are based on are fully scanned in PDF form here*! 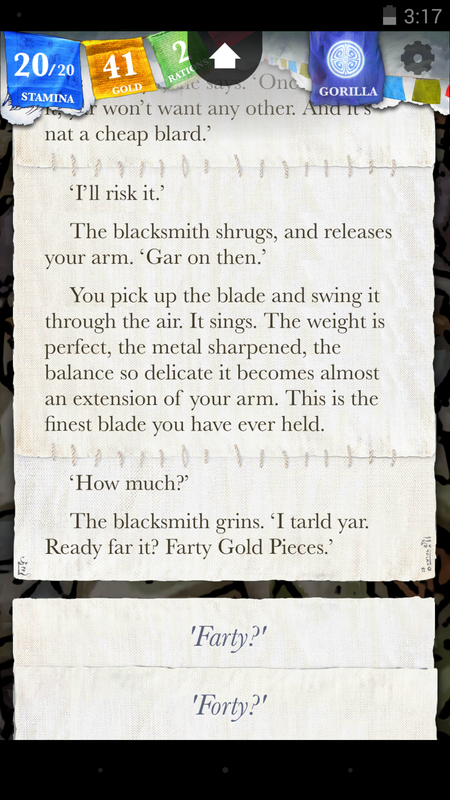 – However, I immediately noticed when I hit the books that developer inkle (a team that includes the very people who created the books in the first place!) added a boggling amount of additional content, tons of dialogue, characters, and interactives to the existing books when they converted them wonderfully into apps. *Steve Jackson’s Sorcery! 1 is based on The Shamumanti Hills. Sorcery! 2 is based upon Kharé – Cityport of Traps. The newly-released Sorcery! 3 is based upon The Seven Serpents. Sorcery! 4 (that will presumably be based upon The Crown of Kings) has not been released yet. A PDF of the spellbook used in the games can be found here.